In the press release, the IOHK team explains that thanks to this new CardanoTestnet, the level of interaction with the community will be much higher as users will have the opportunity to experience for the first time the characteristics of what would be the real Cardano blockchain. Today we launch the second Cardano testnet, which is for the IELE virtual machine (VM) and follows our recent launch of the KEVM testnet. The technology is not only an important step on the Cardano roadmap but also for the industry – in offering robust and reliable financial infrastructure. Developers now have the opportunity to explore the smart contracts technology that will be offered as part of Cardano, and to give us their feedback, which we look forward to receiving over the coming months. The IELE Virtual Machine can understand programs written in Solidity (the native language of the Ethereum network) and “translate” them into a language understandable by the KEVM testnet. This way, code errors that could exist in contracts will be easily identified, allowing efficient and secure writing of smart contracts, providing a “correct-by-design” framework. It is expeted that once this implementation is 100% ready, dapps development will become much easier and attractive, increasing the adoption of this promising blockchain in virtually any software field. A very enthusiastic community is following Cardano’s development. Its academic focus, as well as the constant updates, raise very high expectations within the crypto-verse. Charles Hoskinson, one of the leaders of the project talks about Cardano as a “Third Generation Blockchain” focused on solving the problems of scalability and interoperability faced by first generation ( like Bitcoin) or second generation blockchains (like Ethereum). 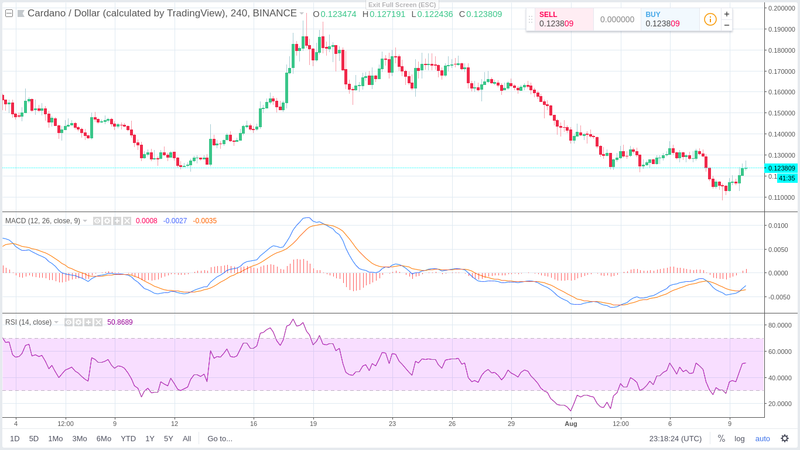 After the announcement, Cardano (ADA) reversed its trend, beginning a bullish run that is steadily increasing its price. Also Indicators such as RSI and MACD show that a steady short-time bullish run is quite possible.